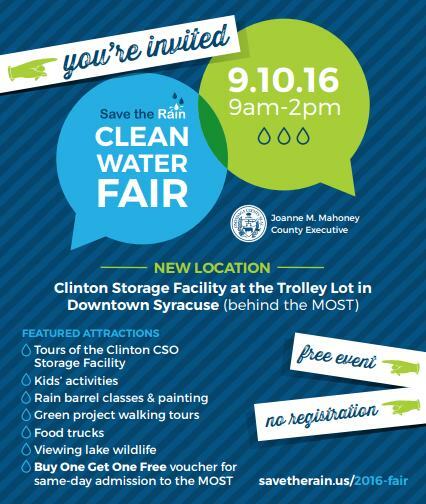 Join Onondaga County Save the Rain for the annual Clean Water Fair – on SEPTEMBER 10 from 9 AM to 2 PM at a new location this year! We’re moving our annual day of fun for all ages. We’re celebrating clean water in Armory Square in the Trolley Lot parking lot – through the tunnel behind the Museum of Science & Technology (MOST). Visit the 2016 Clean Water Fair page for more information or to contact us with questions about the event. Hope to see on on September 10! Next Project: Thanks to everyone who attended the 2016 Save the Rain Clean Water Fair!